Wednesday, September 26 at 5:00 p.m.
Join the struggle for freedom, justice and equality! Come out to SAIA's New Members' Meeting to learn about the movement for Palestinian rights, and how you can get involved. SAIA York is part of the growing global movement for Boycott, Divestment and Sanctions. 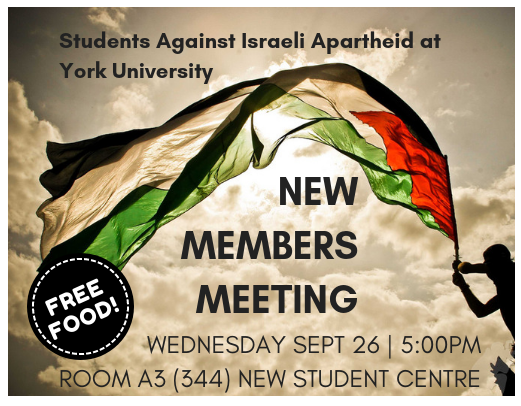 We aim to build and strengthen the Palestine solidarity movement at York University.